The world observed Psoriasis Day on the 29th October. With millions of sufferers across the world this skin disorder is on the increase. Psoriasis is known to be an immune condition which affects the skin and sometimes the joints. The skin which normally takes 21-28 days to renew itself, in sufferers it takes only few days, causing an excess skin leaving a plaque known as the psoriasis plaque. Most people tend to suffer from plaque psoriasis in which it appears on the elbows, knees, lower back and scalp. Others suffer from Guttate psoriasis, which are small and scaly patches of 1cm diameter. For psoriasis to appear, often a trigger is required which can be as simple as a throat infection, injury to the skin, certain medications and physical or emotional stress, etc. Psoriasis can manifest itself at any age. However peaks have been found to be in late teens to adulthood and between the age of 50 and 60. Both males and females are affected equally. For some, there is a family history and for others no. This condition cannot be transmitted from one part of the body to other parts nor can it be transmitted from one person to another. Until now, no cures have been found against this ailment. 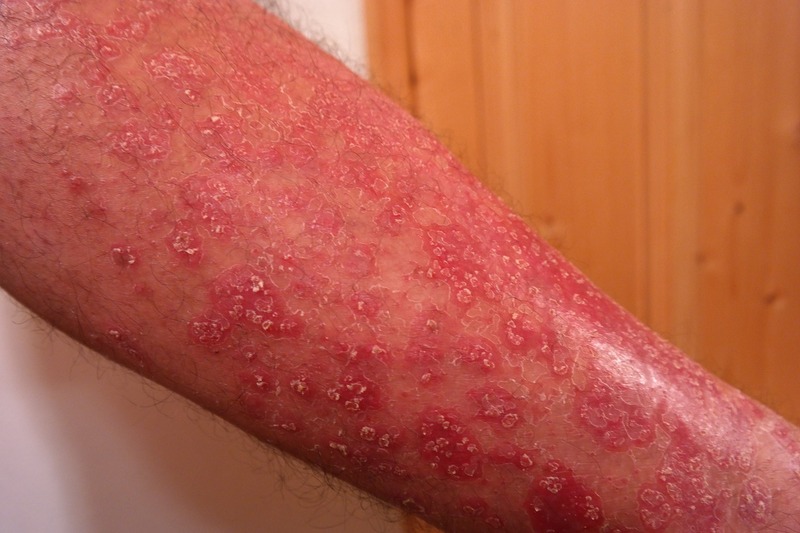 Managing psoriasis is becoming a fundamental for patients to live with this condition. Different treatments are available to help psoriasis sufferers. Topical treatments using various creams, ointments, mousse and gels are available to help keeping the ailment at bay. Many of those topical treatments include Vitamin D derivatives, Coal tar preparations, topical steroids, Vitamin A derivatives, dithranol and calcineurin inhibitors. Dermatologists often prescribe phototherapy treatments using either UVB or UVA lights which have been proved to be very efficient in helping against psoriasis. UVA requires a chemical to be taken known as the Psoralen while the UVB does not require any side medication before its use. Nowadays, handheld devices are available allowing the patients to have the treatments at home. Sizes of the units vary according to the surface areas being treated. This treatment can also be carried out in hospitals and should be discussed with their GPs. For severe cases, systemic medication, which are medications taken inside the body, e.g. tablet, are to be used. However, due to associated potential risks, it is reserved for moderate to severe conditions. Living with psoriasis is the ultimate challenge of a sufferer. Learning to live on a day to day basis with a skin condition takes time and is a journey. With psoriasis, emotional and physical stress should be avoided. Even though the condition can create stress in sufferers, such stress can aggravate the situation. Taking time to relax is very important. Also, sufferers should never think they are on their own. It is very important for sufferers to be honest with their GP, Nurse or Dermatologists about how this ailment is affecting them. GPs can refer sufferers to psychologists working in this field to help them. The Psoriasis Association has materials and forums for any sufferers to be in touch with others in the same condition. A sufferer should never think they are on their own. Listening to other sufferers can often help. We are a phone call away in helping. With research being carried out, we do hope our children will be able to live in better world where psoriasis would be manageable and why not history.